Hot off the heels of speaking at An Event Apart – DC my inspiration tank was full and “flexbox” was a word resonating around the corridors and the conference room. I hadn’t had a period of self-learning for a little while, simply from being too chockablock with client work. I quickly realised I reverted to the way I used to learn to code back in 2001. Paper, pen and repetition by doing. Flexbox, at first, felt very alien to me. Having got used to all the weird quirks and workarounds of using floats for many years, flexbox solved things, quickly, but I wasn’t entirely sure of why. It reminded me of the first time you learned the clearfix method. You were happy it worked, but weren’t entirely sure why. I started breaking down each section and quickly realised a lot of the tutorials online referred to, flex-grow, flex-shrink and flex-basis as three different declarations. I had the most trouble understanding flex-grow, for some reason, until I read Chris Coyier’s CSS Tricks that explained everything is given a value of 1, and therefore, equal. If you increase it to “2”, you’re giving that particular box a property to grow twice as much as the others. That’s when I had the aha moment. The other thing that felt quite alien was the automatic (read: very easy) nature of how flexbox solved problems that have been layout issues for years. I almost couldn’t believe how easy it was and had to triple check various browsers to make sure my eyes weren’t deceiving me. Chris does a brilliant job of illustrating each nuance of flexbox, so I won’t repeat that here. I’ll just tell you about a few of the “aha” moments I had, to hopefully save you a few hours of “but why” questions. Feel free to share any of your flexbox conundrums (and how you solved them) in the comments. It feels a bit like learning the clock trick for padding shorthand, when that came out all those years ago. Imagine three imaginary headings above each property of 1 0 200px. By putting this onto an existing element, such as a <div> you are making that element a flex-container. I got confused when some tutorials kept referring to a “flex-container” like I had to have a special container, aside from any existing element. No. Adding display:flex; to any element makes it a flex container. 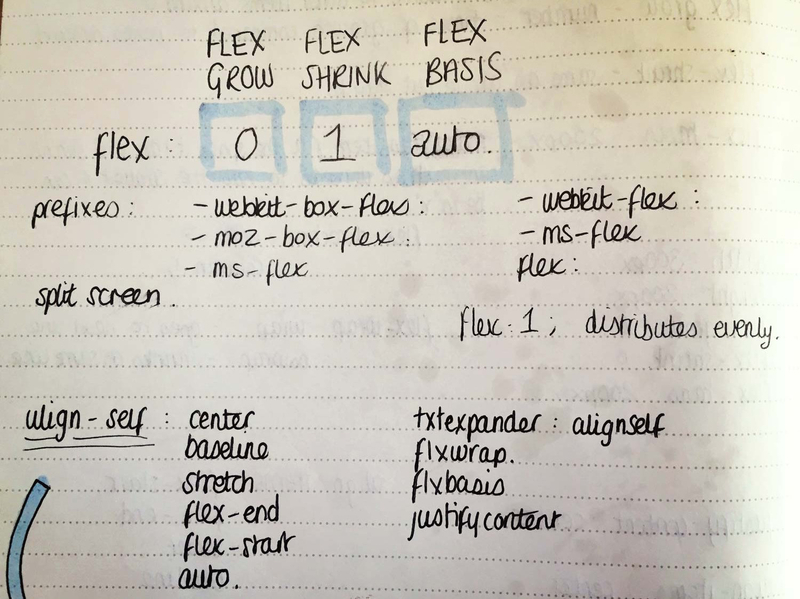 Any child elements of that container automatically then become flex items, with no additional coding required on the children (to make them flex items). There’s lots of them. I wasn’t expecting that. No idea why. For those who use any form of TextExpander, I created a set that I use to help speed things up. You can get that here and import it into TextExpander or aText (which is what I now use).